1963 Chevrolet Fullsize - Bel Air, Impala, wagon- GM , Factory Assembly Manual. 1 book. 391 pages This is the factory assembly manual that was used on the assembly line to build your car. It has hundreds of assembly diagrams, charts and information. These were used as a set of instructions to build cars on the line. It shows how all the parts & assemblies go on the car and in the order they went on. These manuals are a must if you have a car taken apart or want your car to be concourse correct. There is no more debating where or what parts were used it is all in the book. The manual is 8 1/2"x11" pages and are the full books - These are re-prints of the assembly line book of instructions to put the cars together. 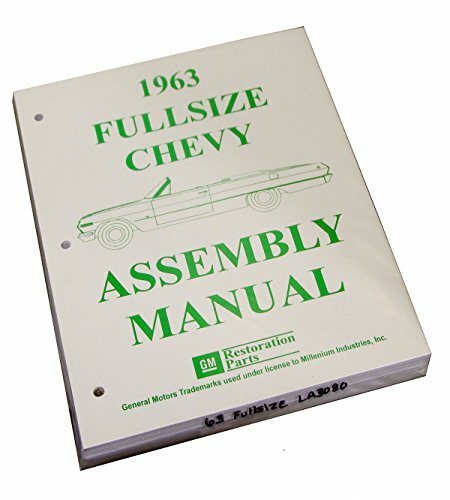 1963 Chevrolet Fullsize - Bel Air, Impala, wagon- GM , Factory Assembly Manual. 1 book. factory assembly manual that was used on the assembly line to build your car.